In 2008 the New Zealand National Maritime Museum featured a 62 page document entitled 'Naval war plan for the attack of Auckland, New Zealand'. This had been produced as an intelligence exercise by visiting United States Naval officers a century before in 1908. 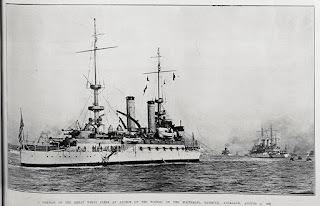 They had come to Auckland as part of a visit by the 'Great White Fleet' of 16 United States battleships, and had spent six days in Auckland. 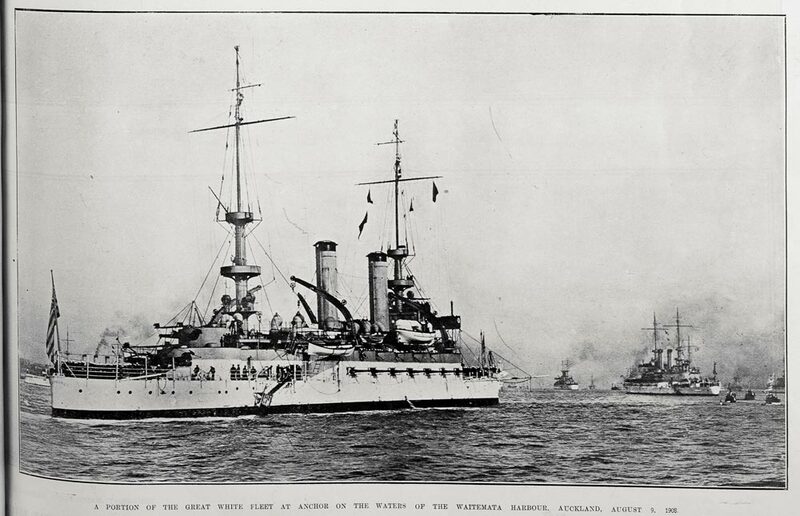 Ref: Auckland Weekly News, A portion of the Great White Fleet at anchor on the waters of the Waitematā Harbour, 13 August 1908, Sir George Grey Special Collections, Auckland Libraries, AWNS-19080813-15-2. Ref: James D Richardson, Looking south from Kerr Street, Devonport showing the American Fleet in the Waitematā Harbour, 1908, Sir George Grey Special Collections, Auckland Libraries, 4-3110. However, the United States of America wasn't the only country to set down wartime contingencies for invading New Zealand. The German government also developed similar plans before the First World War, but theirs wasn't just an exercise. Jurgen Tampke's 'Ruthless warfare' : German military planning and surveillance in the Australia-New Zealand region before the Great War (1998) presents a series of documents from German archives, which have been edited by Tampke. According to the various documents, which date from November 1901 to March 1914, the German consul in Auckland, Carl Seegner, was instructed to charter German private coal steamers in the area to deliver instructions in the event of war. If necessary, vital coal supplies were to be forcibly taken from unprotected New Zealand ports such as Westport by the 'Australian Station' of the German Navy. 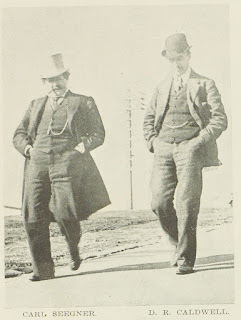 In reality, Seegner wasn't arrested and interned on Motuihe until 1916, there was no attempt to seize any ports and soon after the commencement of the First World War the New Zealand government passed the Trading with the Enemy Act. For further details on the treatment of Germans within New Zealand, see Andrew Francis' "To be truly British we must be anti-German": New Zealand, enemy aliens and the Great War experience, 1914-1919 (2012). Ref: New Zealand Graphic, Carl Seegner, D.R. Caldwell, 4 August 1900, Sir George Grey Special Collections, Auckland Libraries, NZG-19000804-206-1. Seegner became acting Imperial German Consul in 1892 and was a full Consul from 1895. He was born in South Germany in 1848, and from 1866 to 1869 worked in Paris, then London for a year and Montevideo. He returned to London in 1877, and in 1884, newly naturalised, he arrived in Auckland where he established Seegner Langguth and Co., general merchants and importers. He was president of the local German club and for many years a member of the Council of the Auckland Chamber of Commerce. He died in September 1920, having suffered from ill health. Without any documentary evidence, 'John Bull's Register' (16 June 1917, page 3) claimed Seegner wanted to become the German Military Governor of New Zealand (see article on right). Rather than the German Pacific fleet acting as a diversion, the Germans made three errors. They wrongly assumed that Japan would stay neutral in the First World War, instead it joined Britain, France and Russia. They underestimated Australian resolve as the Australians quickly impounded 26 German merchant ships intended to be used as coalers and auxiliaries for the German fleet and HMAS Australia outgunned the German cruiser Emden and destroyed it in November 1914 in the Cocos Islands. Also, British Naval cruisers quickly destroyed the German telegraph station on Yap, in what is now the Federated States of Micronesia, and Japan took over the island.